The working group under Junior Professor Dr. Mathias Beller from the University of Düsseldorf has analyzed the function of a lipid droplet-associated protein. They used fruit flies to demonstrate that the protein has a major impact on growth processes and the fly's adaptation to environmental conditions. The results of the study have now been published in the journal Cell Reports. Around 2005, a protein called CG9186 was discovered in lipid droplet preparations (LDs) of the fruit fly Drosophila melanogaster. Lipids are fats, and LDs are their universal storage organelles. In addition to energy supply, researchers are discovering more cellular processes in which they are involved. The proteins associated with the LDs play an authoritative role in regulating the storage, remobilisation and utilisation of the lipids. This puts them at the focus of current research. 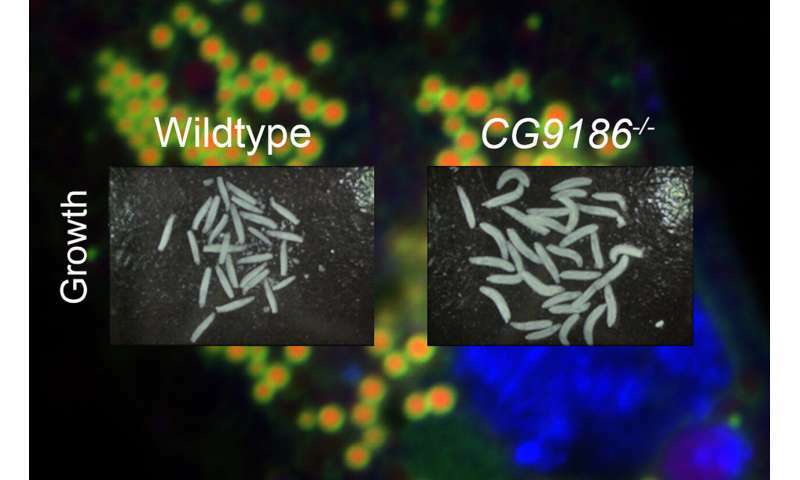 The first step toward characterising the functions of the CG9186 protein was made in 2013 by the group of researchers working with Mathias Beller when they examined the Drosophila protein and its mammalian homologues in cell cultures. What function does the protein family fulfil in the organism? Because the proteins related to CG9186 are located on the fat storage organelles, it was initially assumed that they play a metabolic role. However, studies by other working groups also suggested that an altered level of the human protein could be a factor in the development of cancer. Decoding the protein function is the area that the Düsseldorf-based cellular biologists of the working group "Systems biology of lipid metabolism" led by Junior Professor Dr. Mathias Beller work in. Functions can be decoded in a particularly targeted manner by comparing organisms with the protein in question against organisms without the protein in question. With his working group, Beller used the CRISPR/Cas gene editing method to produce fruit fly variants that no longer contained the protein. Further, they identified interaction partners of the CG9186 protein together with colleagues at HHU. With colleagues from the University of Graz, they characterised the lipid composition of LDs where CG9186 had been mutated. In addition, they compared various metabolic parameters as well as the growth and survival abilities of wildtype fruit flies with those of the mutant variant. The researchers in Düsseldorf made an astonishing discovery—in the absence of CG9186, the fruit fly larvae can no longer adapt their growth to the available food supply. While normal larvae grow more slowly when there is a lack of food in order to survive with fewer resources, the knock-out larvae continue to grow at virtually the same rate. The biologists attribute this disorder to the fact that the missing protein restricts various hormonal signalling paths including the insulin signalling pathway. Junior Professor Beller described the implications of the results as follows: "It's interesting that an LD protein is involved in hormonal regulation of the organism. We will now examine the extent to which the findings from the animal model are also transferrable to humans."